High quality 15m 2x phono to 2x phono stereo audio cable. Metal body phono plugs with Gold Plated contacts. OFC cable with colour coded phono connectors. Ideal for stereo audio connections. Don't be fooled by the low price on this high quality cable. 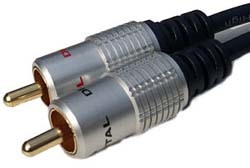 A stereo audio cable with 2x phono / RCA connectors on each end. The cable features oxygen free copper cable, metal bodied phono plugs with gold plated contacts. This cable is ideal for stereo audio connections in Home Cinema or Hi-Fi systems. SVGA to Component Cable, 1m SVGA to component cable 1m. ideal for projector connections. HD15 SVGA / VGA connector to 3 x phono male RGB component. RGB colour coded plugs. Gold plated contacts Pure copper conductors for perfect picture transfer. HD compatible. Length 1m Please note that not all VGA / SVGA connectors will be compatible with component video, for example a PC will most likely output only RGBHV, please ask for advice if not sure.